I participated in the 52 Week Pet Photography Project a couple of years ago. But life intervened and I wasn’t able to continue. Finally now I have a bit of free time and am really excited to get back to participating in the group. Each week, the group is given a different topic to illustrate with a pet themed photograph(s). This week’s topic is Negative Space. Although there is negative space in this image, I can imagine where Bugs, my dog, fills in the negative space with his visions of hunting. What creatures are lurking in those dark shadows in the trees. Be sure and check out the next photographer in the circle, Darlene with Pant the Town Pet Photography serving MA and NH to see what how she has interpreted Negative Space. That sky is insane and I love that hint of sun flare! You created a beautiful mood of mystery with the black and white. The sky was great that night. We have had a lot of gray days, but the sun & clouds really put on a nice display that evening. oh my gosh I love your dog’s name. Bugs that is awesome! Thanks. He really is a bit buggy! I love the light in the this one! And black and white was the perfect choice too. Bugs does look like he’s daydreaming about hunting for critters. Great work on the sky and the project! I love this! For those clouds to have a movement it brings your eyes directly to Bugs. Excellent! Welcome to the group, Judy. What kind of dog is Bugs? This certainly looks like a great vantage point for Bugs to find those critters! I wish we had skies like this. 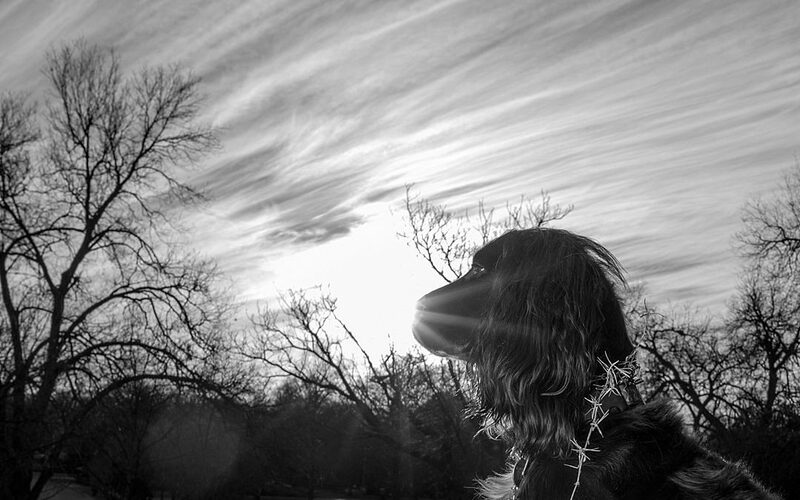 Bugs is a field bred English Cocker Spaniel, also known as a working Cocker. He has a strong prey instinct and has caught two squirrels, a possum, and a raccoon in the backyard. He had some help with the raccoon though. Texas skies can be quite spectaular at times. But we have had a lot of gray days lately. This was an exception.